A new interview is with Tanya from Perù , who was doing her internship at Futuro Digitale. [Tanya] I had an opportunity to work in a multicultural environment. It also helped me improve my Italian as I had to interact with local people and co-workers of Futuro Digitale. In addition, I got to work a very interesting topic regarding the Mediterranean Diet, which broadened my knowledge and skills. [Tanya] Yes. It helps young students to work on a different environment and get to know also other cultures. 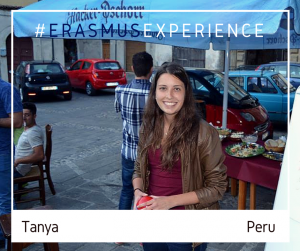 Erasmus participants become independent as they live in a different country and have to overcome these obstacles. [Tanya] I improved my Italian and English and also improved my team competence skills and analytical skills by developing the Mediterranean diet project. [Tanya] It is very important for young people, because it’s a great chance to improve different skills in another environment and helps get a glance of what the real working environment is.